I hope that you have had a good year and feel that you had some really good things to celebrate. This year I have been celebrating, the Tame Your Time Community, A Taylored Space clients and event attendees. You are truly a highlight of my week. I look forward to your sharing and questions. Thank you! We are in the last few days of 2018 and with the holiday season going strong I want to just do a little check-in. 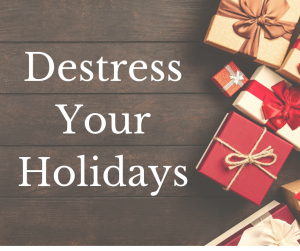 If your answer is not your best, here are some tips to help you destress the rest of your holidays. 1.Practice gratitude- This is a perspective shift. Be thankful for enough and expectantly thankful for what you need to decompress. And if you are saying these things you can’t be complaining at the same time. It’s almost a Jedi mind trick! 2.Limit contact with taxing and toxic people- Yes. This all about maintaining sanity. Your physical and mental wellness are a large factor in your ability to thrive through the holidays. Keeping your stress sources down means there is less chance that you will blow up or break down. 3.Increase reflection & quiet time- This is especially helpful if you are an introvert but really can apply to anyone. If you just need some time away to be with yourself and quiet don’t feel guilty for that. In that quiet time there is power to refocus and gain clarity on what you need and want. 4.Reconnect to what supports you- Keep close the people, places and things that have a positive influence and give you what you need to make the day work. And only you really know these answers so write them out and then go seek them out to include in your holiday. 5.Have some real fun. Not the stuff you go to just because someone invited you. Genuinely Smiling, laughing, engaging with others, doing your high valued things all helps to release positive those feelings can carry over into your attitude through the day and week. It’s kind of like high intensity training right if you can help yourself to a good dose of fun it supports you hours after the laughter stops. 6.Plan your time- Ok I had to throw this in as a bonus. 🙂 But really this is about making sure you can look at the page or screen and see the white space. Don’t cram your day full of any and everything. Leave a little room to breathe. Also if you know what’s next it allows you to proceed without anxiety or guilt- two top emotions that come up when clients say they are overwhelmed and stressed out. The holidays are intended to be a time of positivity, reflection, family and beliefs. We have stuffed them full of food, shopping, tv and stress. Wouldn’t you say it’s time to make a change? Use these tips to get back that happy holiday spirit. I also have an announcement: I am hosting the Get Stuff Done Challenge in January. We’ll share 5 days of action to get your new year off to a productive start so you can get lots of good stuff done in 2019! There will be lots of powerful learning, prizes and maybe even a couple of surprises.  I would love for you to join me and bring a friend who wants a fresh start on the New Year. Happy rest of your holidays and I’ll see you in January.